Jerry Robinson begins this week's program by discussing the current Republican Presidential candidates. Later, Tom Cloud joins Jerry in an interview to discuss the latest news on gold, silver, palladium, and platinum in this week's Precious Metals Market Update. In Segment Two, Jerry is joined by Agora Financial's chief economist, Michael Pento. 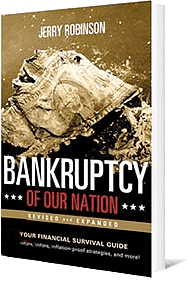 Michael is a fellow Austrian economist and will share his take on the global economic crisis and what lies ahead. In addition, he explains the best way to play these tumultuous markets despite the continuing crisis in the Eurozone. In our final segment, Jerry looks at a hilarious example of the economic ignorance in Washington. We conclude with the Retirement Minute with John Bearss. 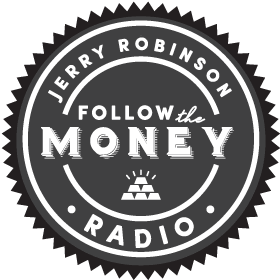 Jerry Robinson is an economist, published author, columnist, radio talk show host, and international conference speaker. Robinson has been quoted as an economic authority by USA Today, FoxNews and many other news agencies. His columns have appeared regularly in numerous print and web publications, including WorldNetDaily, Townhall, and FinancialSense. In addition, Robinson is also the Editor-in-Chief of the popular economic newsletter, Follow the Money Quarterly. He resides in Texas with his beautiful wife. Thomas Cloud is the Chairman of the Board of Turamali, Inc. and has a long and successful advisory track record in both financial planning and tangible assets. His expertise as an financial counselor and thorough knowledge of the products he recommends has attracted an impressive list of individuals and major institutions from across the United States. Since 1977, Mr. Cloud has devoted his attention to all areas of tangible asset investing offering a "hands on" approach to each and every Turamali, Inc. client. For more information about Precious Metals Investing, click here.